The original photo of Sears Castle, formerly "The Towers,"
and may be found on Wikipedia. The Darkling Thrush by Thomas Hardy is as interesting a poem as ever I have encountered. The foreboding tenor of it lends itself particularly to a mystery story waiting to be told. I found this comparative evaluation of the poem and Keats' Ode to a Nightingale, by Ashley Ann Albrecht, a junior at Pine Manor College in 2008 somewhat fascinating and helpful in doing the initial work for the narrative. The thrush, particularly the woodland thrush, is small, unassuming, and somewhat common in appearance, yet lyrical. Birds, with their quiet natures and their aerial perspectives see many of the mysteries in the natural world play out on the ground, watching with indifference and seeming helplessness, unwilling or unable to effect any other outcome than one might accept as natural and inevitable. When I came across this poem, it seemed to fit quite well with the NaNoWriMo project I had in mind for this year's event, to begin November 1, 2018, and I decided to incorporate it into my mystery and to make it the first of myserialbook.com's projects. The book will be written during November, but the first installment chapter will not be edited and released until December 1. So, if you're interested in reading The End of Things at Dark Island before it is released to the world, then subscribe on December 1. Here is a brief introduction to the novel and an excerpt. When Mrs. Effie Portchester arrived in the United States from England she was determined to visit as many of the American castles as she could in a month's time. Her first stop was to be the castle at Dark Island, a place she learned of from her cousin Howard Mantry, who spent his summer months there as a child. Howard, a retired engineer, had only recently visited Effie in England and was treated to a personal tour of Portchester Castle by his hostess, who had married a very distant cousin of the original castle owner, who was an even more distant cousin of Effie's husband, Cullen. The castle and grounds had long since transferred from the last direct descendant of the Portchester family to the government in lieu of repayment of taxes. Until his death the previous year, however, Cullen thought of the estate as his, in absentia. "I know its staircases and its rooms." Howard Mantry looked around, as if there were anyone to hear them in the vast emptiness of the balcony at Portchester castle. "And I know Dark Island's hidden passages," he whispered, "as well as the men who constructed them decades ago." Effie sipped at her tea and looked into his hazel eyes. "There are some things I left behind, in secret hiding places of my own, when I was there as a child, and I am now of a mind to retrieve them. The old castle house, you see, has been placed for sale once again and it's said the interested buyer intends to renovate it and keep it as a private home. It will no longer be a hotel. His workmen just may discover my 'treasures' in the process. I would never be able to retrieve them if that happens." Effie agreed that a visit was necessary and being eager to visit the castles of America, offered to meet him at Dark Island on the 17th of April. 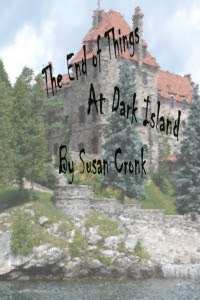 While at Dark Island castle, Effie and Howard find themselves tagging along on the skirts of a mystery that would extend from the port country of Nova Scotia to the Catskill Mountains. What they learn places them in danger. Are they suited to solving the mystery and bringing about The End of Things at Dark Island? Effie has her doubts. "The world is what you make of it, friend. If it doesn't fit, you make alterations."